February is a time for spreading and sharing love. However, this love doesn’t just have to end with your significant other. This love could also include your love for a project you’re interested in and sharing your passion with others. Saanya Bhargava started impact.gravitas after seeing the effects of plastic pollution herself, especially in what she believes is an eco-friendly community. She decided to step up and harness the power of youth activism to raise awareness for and try to stop plastic pollution. Her story shows how despite their age, teens can make a huge different in their communities. Read on to find out more about Saanya and her organization! Throughout the years, Saanya has encountered many forms of plastic pollution. She first learned about plastic pollution in elementary school when her teacher taught their class about the Great Pacific Garbage Patch, an “island” of garbage that is estimated to have 1.8 trillion pieces of pollution in the Pacific Ocean. Saanya experienced pollution herself when she was at Lake Austin and saw plastic just floating around. She realized it was time to take action. Plastic pollution is a huge problem worldwide. As consumers, we are all partly responsible because of how much disposable plastic we consume each and every day. According to Saanya, by 2050, the amount of plastic in the ocean will actually outnumber the amount of fish. This could lead to problems because many marine animals will (and have already) unknowingly consumed plastic thinking it was food, only to get sick later. Because of the food chains, humans themselves will even be affected when they eat seafood. This is the “Playing with Plastic” jellyfish that shows students how plastic can negativity affect marine life. 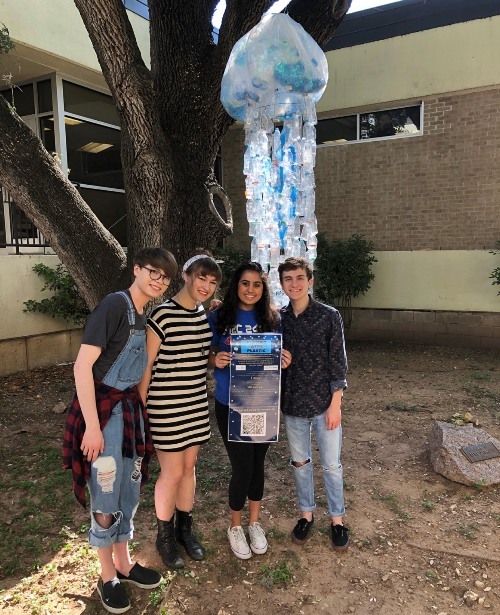 Another of their projects, “Strawless Austin” reaches beyond her high school into the larger community of Austin. Saanya is currently reaching out to numerous restaurants to switch to eco-friendly straws, and she says that manufacturing eco-friendly straws can provide employment opportunities for women in poverty as well. However, Saanya’s promotion of the “Strawless Austin” has not come without obstacles from Austin restaurants who fear that environment-friendly straws would not be economically friendly. “Many restaurants struggle to capture financial benefits from their sustainability efforts. However, offering sustainable straws only to customers that request them reduces the overall consumption and offsets some of the increase in cost for the business,” Saanya said. Saanya regards her greatest accomplishment as helping inspire other teens to become activists themselves, both through social media and in her own community. impact.gravitas has a large team of high schoolers themselves that each assume different responsibilities in the organization. Saanya and her team of fellow youth activists. For Saanya, there are three principles of youth advocacy: boldness, collaboration, and humility. impact.gravitas certainly embodies those criteria. Despite some resistance, Saanya is committed to making Austin’s restaurants more eco-friendly, she works with many other youth activists to promote environmental awareness, and she remains humble despite her honors. Collaboration has been a key part to impact.gravitas’s success. They have a high school officer dedicated to outreach and work together with other organizations against ocean pollution as well as support from the public. 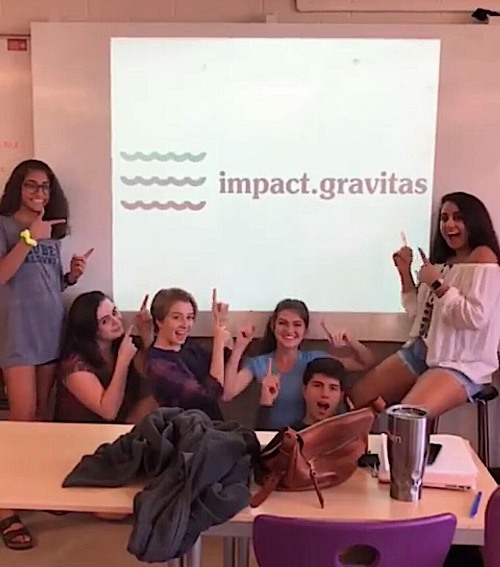 If you are interested in supporting impact.gravitas, you can go to their website at impactgravitas.org. Saanya’s story shows us the importance of one person standing up and fighting for what they believe in. Through her passion, she was able to connect with other teens who are concerned about climate change as well. For the future, she is interested in involving even more youth from around the country and bringing impact.gravitas to college this fall. Anyone can take change and help their community, or even world. All it takes is passion and the persistence to do something. As Saanya says, everyone has a legacy. Now is the time to take charge and figure out yours.